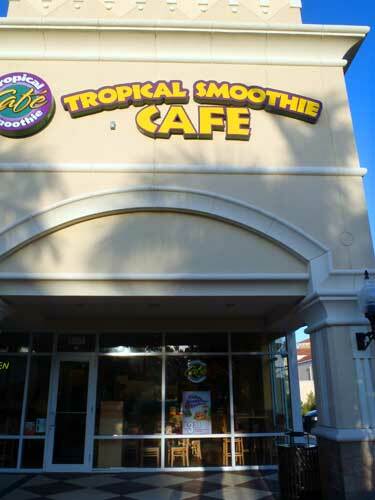 Tropical Smoothie Café, with several locations throughout Dade and Broward, serves surprisingly healthy fare in the form of everything from soups to salads to sandwiches to wraps – oh, and let’s not forget smoothies! It features a superstar roster of the most delectable fruit combinations we’ve ever had the pleasure of experiencing in a cup. 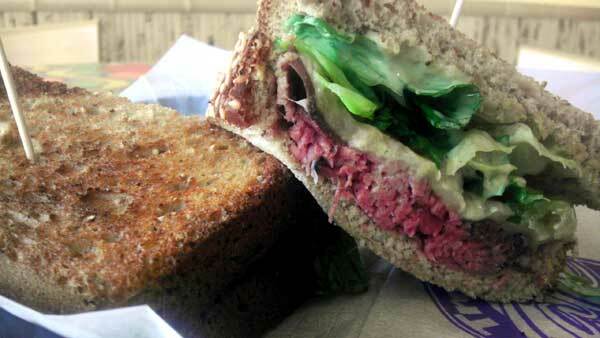 We visited one of the Kendall locations with a wide array of menu items. There are usually three to four daily soups available, as well as several gourmet salads. For starters, the Mango Magic low-fat smoothie ($4.49) was a light and refreshing, super tasty combination of mango, pineapple, and non-fat yogurt. It’s so large that it can easily be shared by two people. In the mood for heartier fare, we decided to go with one of the toasted wraps ($6.99) and a bistro sandwich ($6.99). 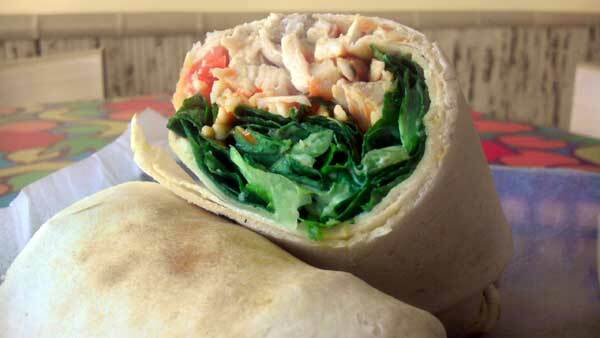 The Buffalo Chicken Wrap made with low-fat mozzarella, tomatoes, romaine lettuce, buffalo sauce, light ranch, and chicken is a good meal for one. It comes with your choice of chips or fruit. Our favorite was the Wasabi Roast Beef sandwich, a perfect blend of ingredients resulting in a happy mouth and an even happier stomach. The combination of pepper Jack cheese, roast beef, romaine lettuce, and wasabi Caesar dressing is flawless. It normally comes on Ciabatta bread, but we opted for the nine-grain wheat bread. The sandwich was fantastic and included choice of chips, fruit, or a cookie. 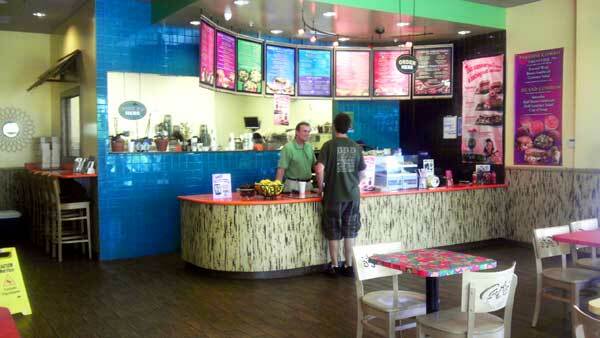 The staff treats you right, from the time you place your order at the counter to the moment your food is brought out. 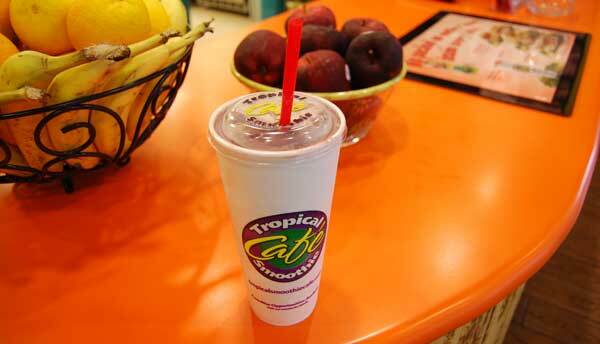 For a quick bite that tastes like it took hours to make, Tropical Smoothie Café is a winner. Monday through Friday, 7 a.m. – 9 p.m.
Saturday, 7 a.m. – 10 p.m.
Sunday, 7 a.m. – 8 p.m.